Ted’s House is where Ted Hughes was born. Situated near the picturesque Rochdale canal with its 19th century stone bridges and an abundance of wildlife, the property has been lovingly restored and is decorated in a 1930s style. Fitted with modern appliances, and with a wifi connection, the house captures the ambience of the era when Hughes was born, but without foregoing comfort. The house sleeps 4 and is open all year round as a holiday let. It's warm and comfortable, with ample space for a family. The house is conveniently sited near the centre of Mytholmroyd and the Dusty Miller pub, which dates from the 18th century. The town is surrounded by the beautiful countryside that inspired Hughes's Remains of Elmet. The house provides a perfect base for anglers - throughout his life Ted was a keen angler - walkers, and cyclists. Within easy reach of both the Pennine and Calderdale Ways, and with footpaths, cycle routes, bridle ways and packhorse trails in every direction, Ted's House offers plenty of options for rambling, riding, or just strolling along the canal towpath to Hebden Brdge, with its array of pubs, galleries and coffee shops. And, as Ted knew from his childhood wanderings, the countryside is rich in wildlife. In Remains of Elmet, as well as snipe, grouse, and curlew, Hughes mentions fox, red squirrel, badger, and weasel. Fans of Hughes's work may choose to sleep in the light and airy attic room where Ted slept as a child; peruse the photographs of Ted and his family, and browse through the collection of his works donated by his widow, Carol Hughes. 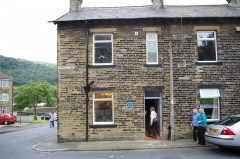 Copies of his work can be purchased from The Bookcase in Hebden Bridge, one of the country's leading independent booksellers, regularly shortlisted for publishing industry awards. Only a short drive away - or a bus ride from the centre of Hebden Bridge - is Haworth, home of the Bronte sisters. From there it's a short hike to Top Withens, a favourite with Hughes and the Brontes, and said to be the inspiration for Emily Bronte's Wuthering Heights. To stay in Ted's House, click here to make a booking through our agent Cottages4You. COPYRIGHT © THE ELMET TRUST 2014. ALL RIGHTS RESERVED.